The amaryllis is a tropical flowering plant that grows from a large bulb. Flowers are large and showy and come in many shapes, sizes and colors, many in the pink to red range. The “Royal Red” variety produces a bright red flower that will rebloom every year. Other varieties include Aphrodite, Challenger, Clown, Amigo and Blossom Peacock. 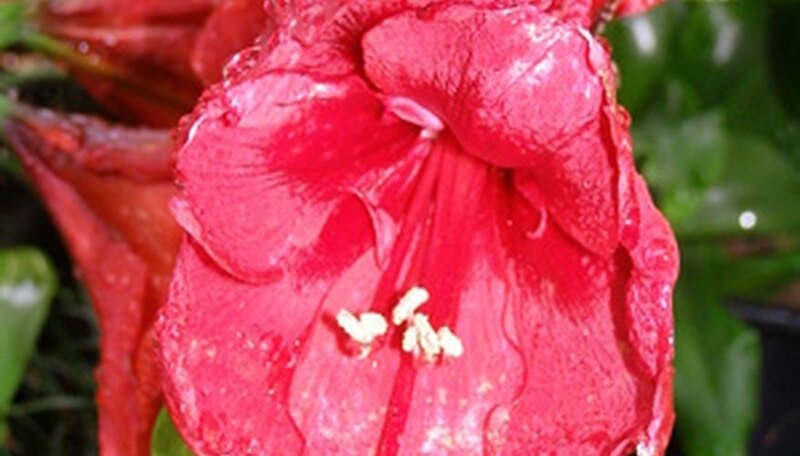 Proper fertilization is key to ensuring the best-quality amaryllis flowers. The amaryllis belongs to the plant genus known as Hippeastrum. Seventy to 75 species exist, with over 600 hybrid cultivars. It is a true bulb—bulbs are very large—and it comes from tropical South American areas. “Amaryllis” is actually a misnomer: Hippeastrum is but one genus in the large Amaryllidaceae plant family. This family includes nearly 60 genera, of which “amaryllis” is only one. The strap-like leaves emerge at ground level and the flowers grow upward from the center on nearly equal stalks. Some varieties, such as the “Naked Lady,” have no apparent foliage—it dies back before the pink flowers bloom, giving them the “naked” appellation. Amaryllis plants can grow from 18 to 36 inches tall, depending on the variety. You can grow amaryllis in well-draining garden soil or in pots. If you grow your amaryllis in a pot, make sure it has at least one drainage hole and use a standard potting mix. If you live in USDA hardiness zones 8 through 10, you can grow amaryllis in the ground. Work 1 to 2 tbsp. bone meal into the planting hole, which must be deep enough to contain the entire large bulb. Set the bulb into the planting hole, ensuring that its tip protrudes slightly above the soil surface. North Carolina State University advises against using pine bark in any soil where you grow amaryllis; a mixture of peat moss and perlite makes a good growing medium. Keep your amaryllis in an area with all-day sunlight and keep the soil moist, but not soggy. After you plant your amaryllis bulb and it begins to form foliage above the soil surface, begin a fertilizer regimen. It is important not to fertilize your plant until it has foliage, according to Clemson University. You can choose from a slow-release fertilizer or a liquid formula. With both types of fertilizer, make sure the one you purchase is balanced, such as one having an N-P-K ratio of 10-10-10. Apply slow-release fertilizer every three to four months; fertilize with a standard liquid fertilizer two to four times monthly, at evenly spaced intervals. At this stage of their development, amaryllis need as much natural sunlight as you can give them. After your final spring frost, move your potted amaryllis outdoors where it will get maximum sunlight. Some older leaves will die back; simply snip them off to encourage new leaves. Water your plant every day at this time, according to the United States National Arboretum. When your plant has a good number of healthy leaves, begin fertilizing it with a lower-nitrogen fertilizer, such as 0-10-10 or 5-10-10, according to Clemson University. This type of plant food is available commercially as a “blossom booster” fertilizer or similar name. The University of Florida website recommends using a low-nitrogen, slow-release fertilizer from March through September, making sure to follow package instructions. You can determine the time of year your amaryllis blooms by giving it an artificial dormant period, according to the University of Florida. For example, for Christmas flowers, place your potted amaryllis in a cool, dark location (about 55 degrees Fahrenheit) in mid-August and stop watering it. Stop fertilizing at that time. Begin introducing the plant to sunlight after six to eight weeks and resume watering and regular care at that time.